Donald Trump and Hillary Clinton like to talk tough on trade, arguing both the Trans-Pacific Partnership (TPP) and the North American Free Trade Agreement (NAFTA) had negative effects on American competitiveness. But those involved in the production and transport of goods know lower barriers to trade at one end can lead to exponentially lower costs at the other end of the supply chain. In fact, much of the country appears unconvinced by the candidates’ opposition. A September Council on Global Affairs poll indicates 59% of Americans believe trade is good for the economy, while an August Morning Council poll suggested 80% of Americans have not formed an opinion (45%) or support the TPP (35%). The candidates diverge with previous presidents, too: Former President George W. Bush began negotiations for the TPP in 2008, leaving President Barack Obama to sign the final deal in 2015. Now, as his term comes to an end, Obama has pledged to make a final push for U.S. Congress to pass the bill in December, before either candidate takes office. With over 18,000 tariff cuts, the TPP can drastically reduce the costs of shipping materials or parts throughout the supply chain. Not passing the agreement could lead to a loss of U.S. export competitiveness. The main argument in opposition of the agreement, that trade kills domestic manufacturing, is flawed or unconvincing. Business to business trade is the bedrock of the economy. After all, sales of finished goods, which factors into the Gross Domestic Product (GDP) formula, are but the final step in the supply chain. The rise of the internet, the end of the cold war and the expansion of free trade agreements over the last 30 years has allowed companies to increasingly source beyond their borders to find the competitively priced materials. "When you think about supply chain professionals and supply chains, they're inherently global," Guy Courtin, vice president of industry and solutions strategy at GT Nexus told Supply Chain Dive. "Whether it's state borders, international borders, there's much more of a global view of it." The trend will only strengthen with time: the B2B procurement network SAP Ariba, for example, recently announced an expansion to China to facilitate transactions with the country's suppliers. However, any executive sourcing from foreign countries knows that tariffs can add a high percentage costs relative to the savings earned from cheaper labor. The TPP provides an opportunity to expand the pool of suppliers in compliance with various sustainability and human rights standards, all the while reducing tariffs for 18,000 goods. Click on the adjacent link for the full summary. "I think from a supply chain standpoint whenever we can reduce friction in trade, whenever we can improve some of the rules and regulations when it comes to competitive nature with regards to certain countries and regions, I think it's always positive," Courtin added. One of the most important chapters in the agreement is the yarn-forward clause, which makes tariff reductions on fabrics and textiles conditional upon the product being sourced entirely from TPP regions. In other words, casual-wear retailer Uniqlo would have to shift its supply chain entirely away from China towards other pacific countries if it sought to receive the same benefits as other TPP-sourced products. Companies would face lower risks of ethical violations within TPP countries, too, since parties of the agreement all commit to enforce labor, privacy, trade secrets and human rights standards or be subject to sanctions. In a more relatable example, Target recently distributed a pamphlet to its employees encouraging them to support the TPP, arguing apparel import taxes are 12% higher on average than tariffs on other goods. "All of these categories will be import tax-free on day one with the TPP," the pamphlet states. The costs are not directly transferrable, but the reduction would almost certainly transfer to cheaper prices for consumers. Opponents argue Free Trade Agreements (FTAs) encourage companies to relocate and take advantage of cheap or ill-enforced labor laws, which has led to the flight of millions of domestic manufacturing jobs. Proponents, however, argue that trade increases the value and skill-requirements of domestic jobs and makes U.S. products more competitive, while refuting a causal link between FTAs and job flight. Although each side presents various legitimate arguments, one thing is certain: The U.S. economy was radically transformed due to trade although the issue is too nuanced to create causal links. "Trade agreements don't either really create or cost jobs, they're really fundamentally about efficiency," said Marc Busch, the Karl F. Landegger Professor of International Business Diplomacy at Georgetown University. "The problem that we have in trying to blame NAFTA for all of those alleged job losses is that NAFTA happened during a very busy time," he added noting the World Trade Organization and the U.S.-Canada Free Trade Agreement launched during a similar timeline. In fact, manufacturing was on the rise in the 1990's: the sector gained 420,000 jobs in the six-year period after 1994, per the Bureau of Labor Statistics. The gain may not be incredible, but is hardly an indictment on trade. The manufacturing sector began to decline in 2000. 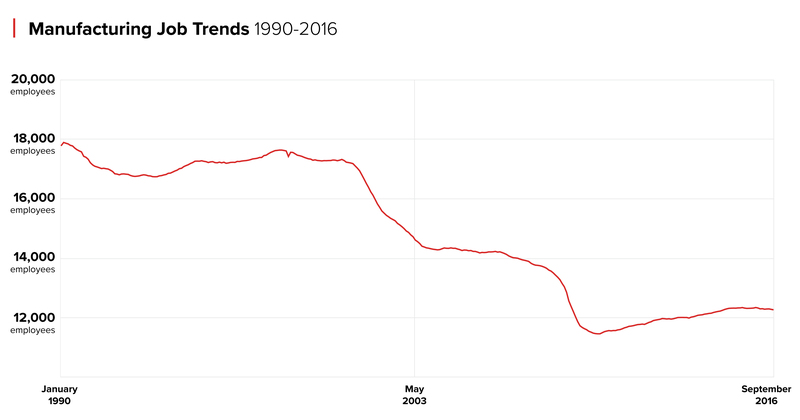 Meanwhile, Detroit is often used as an example for how trade killed manufacturing, but the city’s decline started far before NAFTA and the 2000s. The decline was mainly prompted by economic troubles in the 1980s. A close look at the Bureau of Labor Statistics data on employment in the sector reveals the main decline actually happened after 2000, with another big decline after the Great Recession of 2008. Certainly, the U.S. signed more FTAs during this period than any other period in history, but the countries mentioned are hardly what many Americans consider as destinations for job and business flight. The list includes Jordan, Australia, Chile, Singapore, Bahrain, Morocco, Oman, Peru, Panama, Colombia and South Korea. So what really happened to American manufacturing? "Let's be real, we're not making shoes here in Allentown anymore," Gary Barraco, director of global product marketing for Amber Road told Supply Chain Dive. But, he added, "there is huge acreage that they've used up for distribution centers. This is where American jobs are going to go." States like Pennsylvania have benefited from a recent boom in logistics-related services that may have replaced the seasonal jobs previously provided by manufacturing, he notes. Despite a decline in jobs, pay remains on the rise. 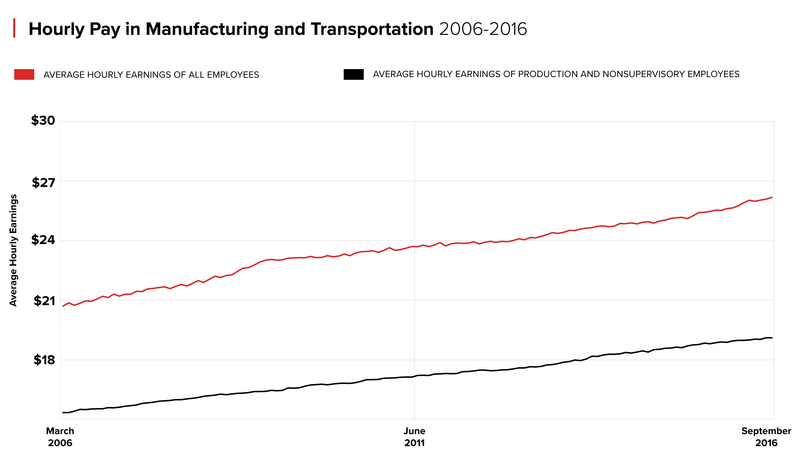 And while the national data is not complete – the Bureau of Labor Statistics only began recording average hourly earnings for manufacturing in 2006 – the last 10-years show a consistent growth in pay despite an overall decline in available jobs. The transportation sector, too, has seen significant growth in pay over the last 30-years. "With a booming trade economy, with strong consumer confidence we have the potential to grow on a different level other than manufacturing," said Gary Barraco, director of global product marketing for Amber Road. "All of the back-end that happens with design, development, sourcing, import, export and distribution and eventually what hits the stores — there's huge opportunities for U.S. employment for people of various skill levels." Both sides of the debate over trade and manufacturing agree that the ideal goal for future administrations should be to improve the competitiveness of U.S. goods, although the means to achieve this vary. Regardless, many voices throughout the supply chain have come out to endorse the agreement, arguing not doing so would threaten the competitiveness of U.S. goods. "We would much rather see the U.S. involved in setting the standard for trade with Asia, than to have China do it," UPS CEO David Abney told The Wall Street Journal in an interview, "Other countries aren't sitting by if we pass up on this opportunity." Meanwhile, the American Farm Bureau Federation, the Coalition of Services Industries, the Information Technology Industry Council and the National Association of Manufacturers wrote a letter to Congress urging the body to pass the agreement. "Failure to act on the TPP will only keep the United States at a competitive disadvantage globally, to the detriment of America's farm, manufacturing, services and technology sectors and the American workers that depend on jobs in each of these sectors," they wrote. The competitiveness arguments can be summed up in two points: First, if the deal does not pass, the U.S. will lose its opportunity to set the standard for trade agreements and risk being excluded from one of the largest agreements to date. If it does pass, U.S. businesses will benefit from the reduction of 18,000 tariffs which would still apply to businesses operating from China, Russia, India, South Africa and Europe. Yet, given the drastically lowered intermediate costs, the lack of causal clarity on the negative impact of trade, and the opportunity such an agreement provides for pricing competitiveness, supply chain managers should favor the agreement. Have a reaction to this article? Submit your viewpoint to [email protected]! For a summary of selected chapters in the agreement, see the Supply Chain Dive Infographic!